San Antonio, Texas is ahead of most other cities in designing and implementing reforms and strategies to support the academic and linguistic development of their dual language learners (DLLs), a new report from New America’s Dual Language Learners National Work Group finds. Since 2000, the number of DLLs enrolled in U.S. schools has grown by 18 percent, but many communities have experienced unprecedented growth in DLL enrollment — it grew by 610 percent in South Carolina, 306 percent in Kentucky and 255 percent in Nevada. 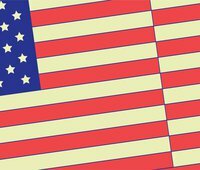 As districts in these states and others grapple with how to best serve these students, they can look to other districts with a long history of educating DLLs for lessons and replicable practices. 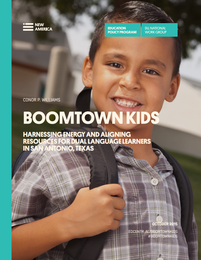 Boomtown Kids: Harnessing Energy and Aligning Resources for Dual Language Learners in San Antonio, Texas examines the history, design, implementation and effectiveness of three essential initiatives that the city has adopted in order to better support its DLLs. First, the city has made a significant investment in expanding access to high-quality pre-K through its new PreK4SA program. "We know that pre-K is particularly beneficial for DLLs. But we also know that pre-K programs work best for these — and all — students when they’re designed and implemented carefully. It's early days yet, but leaders of San Antonio's PreK4SA program are building a strong, comprehensive early education program that could be a model for other local policymakers,” says Conor P. Williams, director of the DLL National Work Group. Second, local school districts in San Antonio are also focusing on supporting DLLs’ home languages by updating their language instruction models. The Harlandale Independent School District and Northside Independent School District have launched dual immersion programs to help DLL students become fully bilingual and biliterate in English and Spanish. DLLs enrolled in these programs demonstrate high academic achievement, especially when compared to DLLs not enrolled in dual immersion. Finally, a variety of community organizations are coordinating with area schools to develop dual-generation and family engagement programs that support DLLs and their families. For example, the Eastside Promise Neighborhood launched a program that provides parents/caretakers of young children with the opportunity to pursue a post-secondary degree through tuition scholarships and by covering child care supports, after school and other costs. DLLs can particularly benefit from thoughtful investments in access and quality across the PreK–3rd grades. DLLs do best when educators treat their families as a critically important educational resource. Coordination across sectors and funding streams is as powerful as it is difficult. Goal-setting and faithful reform implementation require educators to collect and use data. Home language instruction helps DLLs’ long-term success, and efforts to expand its use at school require a corresponding human capital strategy. “From its new pre-K investments to its bilingual programs in elementary school to innovative 'dual-generation strategies’ in the Eastside Promise Neighborhood, San Antonio's doing perhaps more to support DLLs' success than any other U.S. city,” concludes Williams.